Make a Tee-Quilt from your athletic, vacation, & school t-shirts. In the race of life, there are two things that get you to where you want to be: training and preparation. Training and preparation help you achieve your goals. If you don't keep those tangible references to those victories or accomplishments, the memories will fade, and you will have nothing to show for it. 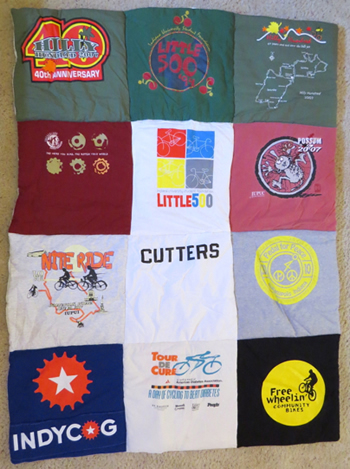 A Tee-Quilt will be a great way to preserve those T-shirts, and never let the victories fade. Traveling, meeting new people, and having new experiences is how some of the best memories are created. Imagine having a quilt made from your favorite photographs. Well, as you can imagine, that would not be very comfortable, however; a Tee-Quilt is very comfortable. Take your vacation t-shirts and wrap up in those memories with a Tee-Quilt. School memories are some of the best memories of your life. While shirts from these happy times may fade, your memories don't have to! If you combine all of those fraternity, sorority, or school themed t-shirts into a Tee-Quilt, you'll no longer have to wonder what to do with those unworn t-shirts in your closet!